FAREED ZAKARIA, HOST, “FAREED ZAKARIA GPS”: Mohamed, what do you make of the most recent moves by President Mubarak, appointing Omar Suleiman as his vice president, appointing another former army officer as the prime minister, the former aviation minister. What is your reaction? MOHAMED ELBARADEI, EGYPTIAN OPPOSITION LEADER: Well, Fareed, I think this is hopeless, desperate attempts by Mubarak to stay in power. I think it is loud and clear from everybody in Egypt that Mubarak has to leave today, and it is non-negotiable for every Egyptian. People have been saying or demonstrating for his — for him to leave. Today, the demonstrations say that he should be put to (inaudible). If he wants to save his skin, if he has an iota of patriotism, I would advise him to leave today and save the country. ZAKARIA: Do you want President Obama to come out and publicly ask President Mubarak to resign? ELBARADEI: I — I mean, obviously, that is going to happen, I think, Fareed, if not today, tomorrow, you know. It will happen that he has to leave the country within the next three days. That is — there is no way out, as I see it. It’s better for President Obama not to appear that he is — he is the last one to say to President Mubarak, it’s time for you to go, leave in dignity before things are going out of hand. We have seen the fate of many dictators. I do not want to see that happening in Egypt. FAREED ZAKARIA, HOST, “FAREED ZAKARIA GPS”: Mohamed ElBaradei is, perhaps after President Mubarak, the crucial figure in this story. After his leaving his post as head of the world’s nuclear watchdog, the International Atomic Energy Agency, he has devoted himself to agitating for change in Egypt, his home country. And how he is the most high-profile leader of the opposition movement in Egypt. He was put under house arrest on Friday, but is able to join me now from his home in Cairo. Thank you for joining us, Mohamed ElBaradei. MOHAMED ELBARADEI, EGYPTIAN OPPOSITION LEADER: It’s always a pleasure to be with you, Fareed. ZAKARIA: Mohamed, what do you make of the most recent moves by President Mubarak, appointing Omar Suleiman as his vice president, appointing another former army officer as the prime minister, the former aviation minister. What is your reaction? ELBARADEI: Well, Fareed, I think this is hopeless, desperate attempts by Mubarak to stay in power. I think it is loud and clear from everybody in Egypt that Mubarak has to leave today, and it is non-negotiable for every Egyptian. People have been saying or demonstrating for his — for him to leave. Today, the demonstrations say that he should be put to (inaudible). If he wants to save his skin, if he has an iota of patriotism, I would advise him to leave today and save the country. ZAKARIA: And what would you like to see happen after that? Let us say Mubarak resigns. What is the — what are the next steps that must happen in Egypt? ELBARADEI: Well, the next step, Fareed, as everybody now agrees on, is a transitional period, a government of national salvation, of national unity, and that will prepare the ground for a new constitution, free and fair election. These are the three basic demands, what every Egyptian is agreeing upon. And of course, you know, hoping that the army will be able to control the situation. Right now, Fareed, the country is ablaze. Looting is everywhere. Disbanded police forces that were disbanded for — nobody knows how they were disbanded — are looting around the country. The army is not able to control things. Millions are in the streets. This is a country that’s falling apart, and the — he needs to leave today. That’s what we hope helps (ph), at least 70 percent, to be followed by a smooth transition of a national unity government, to be followed by all the measures set in place for a free and fair election and democratic constitution. Egypt needs to catch up with the rest of the world. We need to be free, democratic, and — society where people have the right to live in freedom and dignity. That’s what you get after 30 years, Fareed, of utter brutal dictatorship supported by everybody in the name of pseudo-stability. ZAKARIA: You mention the army, Mohamed. Talk about that, because Omar Suleiman is himself a former — a member of the armed forces. The new prime minister is. There is speculation that the army is backing these moves by Mubarak and has in effect taken control of the country. 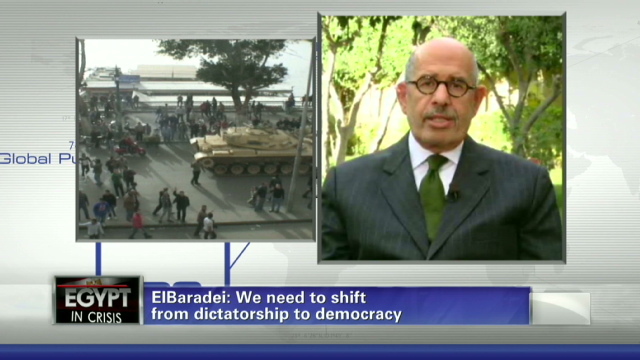 ELBARADEI: Well, I don’t think that the army has taken control of the country, Fareed. If you — if you look around, there’s half million people everywhere, in the middle of Cairo, in the middle of Alexandria. Omar Suleiman is a person I know. I have respect for him. But the army is (inaudible) not change of personality. We need a change of system. We need to have substantive, drastic shifts from a dictatorship into a democracy, like the rest of the world. What I have been authorized, mandated by the people who organized these demonstrations and by many other parts of the Egyptians, (inaudible) if you like, to agree on a national unity government. And I hope that I would — I should be in touch too with the army, and we need to work together. The army is part of Egypt, and we have the highest respect for them as civilians, and we need to work together to get Egypt (inaudible). What do we have today? A country that’s falling apart. ZAKARIA: You say you are — you hope to be in contact with the army. Have they reached out to you? Do you intend to reach out to them? ELBARADEI: A country is — no, I lost it. ZAKARIA: Mohamed, you mentioned the army being in contact with you. Have you reached out to them? ELBARADEI: Not yet, Fareed. I haven’t. I mean, the whole situation has been moving very, very fast, and — but today there has been a number of declarations by different parts of the Egyptian society, from right, left and center, mandating me to work in — with them, go to the army, with everybody in Egypt, with outside world, to ensure smooth transition. We need a smooth transition. Our image, our vision, Fareed, is to have a year of transition where we move from where we are today, a lawless country into a country with democracy and social justice. And I hope you and the world will listen to that, to the thunder of the Egyptian people, who made their demand through their feet and in (ph) the (ph) street, with me joining them. You can’t, Fareed, continue to say, well, we are walking a tight rope, that the rope broken. You are either rooting with the people or rooting with the dictatorship. There is no other third way. ZAKARIA: You’ve heard President Obama’s statements in which he says he has asked President Mubarak to act on his promise to change, to bring democracy to Egypt. Do you think — do you want him to do more than that? ELBARADEI: Of course I do. I have, as you know, the utmost respect for President Obama as a person. I worked with him during my time at the IAEA. I have a lot of admiration for him. But I can tell you, honestly, as a friend of the U.S., that your policy right now is a failed policy, is a policy that is lagging behind, is a policy that is — is — having the effect here in Egypt that you are losing whatever left of credibility. People need to see that you not only talk the talk, but walk the walk, and people need to understand and believe that you really seriously take democracy, rule of law, freedoms seriously. And to say we have a tight rope that — and between the people and the dictator, to say that we are asking a dictator who’s been in power for 30 years to implement democracy is an oxymoron, frankly. And — however, this is — this has been — will be overtaken by events, and I want to be on top of things. Your policy right now — and this is an honest advice, Fareed — is absolutely has no credibility here in Egypt. That is — that is coming from a friend of the U.S., somebody who lived in 15 years in the U.S. and worked for throughout my life in the U.S. I would like to see a democratic Egypt, continued — a democratic Egypt that is able to have a friendly relationship with the U.S. We have always had a lot of common interests, and there is not even the belief that a democracy here will not lead to a better relationship with the U.S., based on respect and on equity. They are in favor of a federalist (ph) state. They are in favor of a wording on the base of constitution that has red lines (ph) that every Egyptian has the same rights, same obligation, that the state in no way will be a state based on religion. And I have been reaching out to them. We need to include them. They are part of the Egyptian society, as much as the Marxist party here. I think this myth that has been perpetuated and sold by the regime has no — has no iota of reality. ELBARADEI: Of course. I mean, I — again, the whole issue of peace in the Middle East is an issue which everybody — nobody wants to go to war, Fareed. Nobody was — not want not to have peace in the region, but as you know, the (inaudible) the credibility is not really whether you are supported by a dictator here. It’s whether you have a fair-handed policy, vis-a-vis the Palestinians. And that is really the question. The criteria is not the reaction of the Egyptians. And you’ll get the same reaction under Mubarak, under a democracy. The people feel they are unfairly treated. There is a double standard vis-a-vis the Palestinian issue, and that will continue. But if you want to have Egypt and the rest of the Arab world have into policy as recognition of Israel, well, you need to review your policy. And however, you know, whatever, what — whatever is going to happen, you know, I am confident that dialogue, negotiation between democracies is much more effective than dialogue between dictators who are in no way representing their people. ZAKARIA: And finally, would you be wiling to serve as a president, as an interim president, if Mubarak were to step down? ELBARADEI: I’m willing to do whatever I can do to save this country, Fareed. You know, this is not my priority. I have a lot of interests in global issues, as you know, humanity, inequity, arms control, and I continue to be active on all these issues. But if my people here, the Egyptian people want me to serve as a bridge from authoritarian system into a democracy, I will not let them down. That is — I owe it to them here. ZAKARIA: Mohamed ElBaradei, pleasure to have you on, and I hope we’ll have you on again soon. ELBARADEI: Pleasure to talk to you, Fareed.